Crypto Currency Institute Review – Misleading Learning Platform is a Bona Fide Scam! Crypto Currency Institute, hosted at CryptoCurrencyInstitute.org, functions as the delivery method for a more sinister investment opportunity known as Cryptocurrency Codex. Operating in an round-about way, Crypto Currency Institute stages their site as a webpage that offers a completely free report that is meant to provide applicants with a simple method to obtain a good ROI with cryptocurrencies in a short duration of time. Incorporating fictitious pressure inducing widgets while providing a completely free PDF may seem like a promising offer for most inexperienced day traders. However, their true motive isn’t to be nice by offering you a free crypto report but rather to obtain your email address to solicit you to purchase their other investment schemes. To learn more about why Cryptocurrency Codex and Crypto Currency Institute are bona fide scam operations we encourage you to keep reading our impartial and factual review. Crypto Currency Institute operates as a landing page that is meant to solely obtain crypto consumer’s email address. Incorporating a phony backwards countdown timer, we have seen this widget time and time again across illicit scam operations that implement them as a way to hurry up and rush the visitor on their site. However, just as with most of these pressure inducing widgets, all a page visitor has to do is refresh the page and it will return to their original value. While the incorporation of fictitious web widgets aren’t of main concern, the obtainment of a visitors email address is. 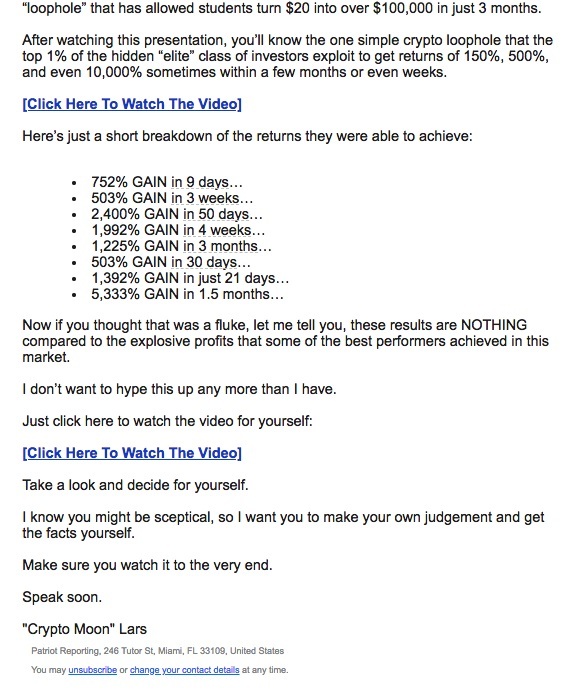 While day traders believe they are giving up nothing of value and receiving a free report that provides insight on proven ROI methods, in reality they are handing over their own personal information in the form of their email address. Within a couple minutes of providing your email address, investors will receive an email from Crypto Currency Institute regarding their true offer. As you can see in the image above, the email received is a clear sales pitch that claims that they have found a loophole that has enabled them to generate ridiculous returns. Claiming that the loophole has enabled them to generate a 752% gain in 9 days, 502% gain in 3 weeks, 2,400% gain in 50 days, 1,992% gain in 4 weeks and the list goes on and on. While this is great and all, this is where Crypto Currency Institute serves as the delivery method for their actual campaign offer which would be Cryptocurrency Codex. Engraved into the template of that email would be hyperlinks that enable the user to watch the video, which when clicked on, redirect them to a separate landing page at Cryptocurrency Institute which is where they showcase the Crypto Currency Codex system. Unlike the Crypto Currency Institute home page, their secondary landing page incorporates a promotional video with a paid spokesperson and a voice over done by the alleged founder of Crypto Currency Institute known as Pat Kendrick. Sadly, we wasted nearly an hour of our time being bored to death by the promotional video they incorporated on their site. Available at YouTube, let us spare you the agony and inform you ahead of time that nothing of value is offered through the entire promotional video. No insight regarding this alleged loophole that can generate massive returns along with no identifiable information is referenced at any point throughout the pitch video. Day traders who remain unconvinced and wish to donate to the Crypto Currency Institute plague can do so by going below the pitch video and prompting the Add to Cart button. 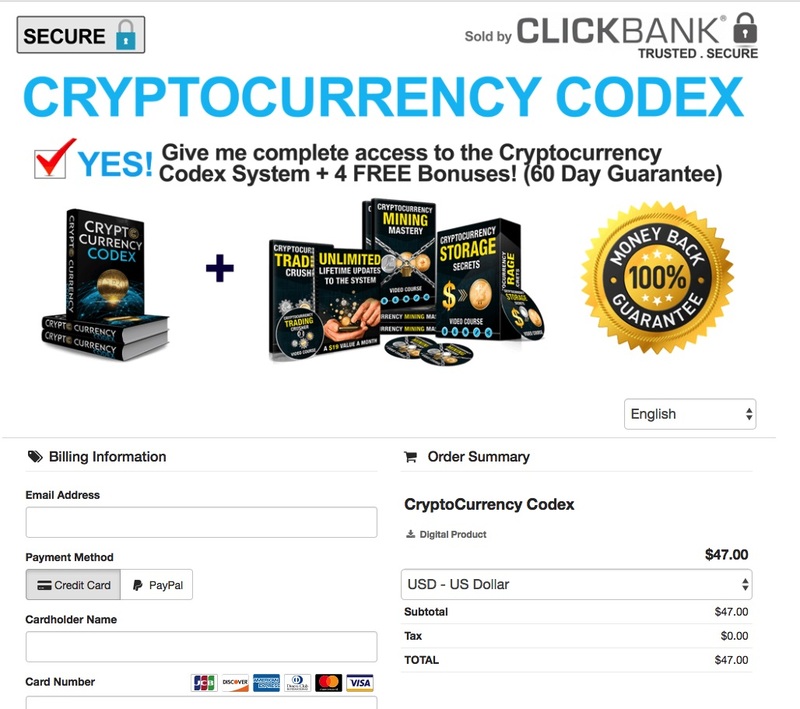 Once clicked, visitors will be redirected to a payment portal where they will then be able to purchase the too good to be true Crypto Currency Codex system. Does the site promote unbelievably high returns? CryptoCurrencyInstitute.org boasts some pretty ridiculous returns while failing to disclose any transparent evidence. Claiming some outrageous gains exceeding over 2,000% within a short duration of time while not disclosing any transparent evidence is not only ludicrous but also further discredits this operations overly lacking legitimacy. Is there any information regarding owners, operators or a corporate entity? Crypto Currency Institute does not disclose any operator, creator or ownership information anywhere on their site. It is clear in the Terms and Conditions page that their operation is acting as their own active entity and will not be help liable in any way what-so-ever for any circumstances that may occur from the utilization of their system. According to a WHOIS report, CryptoCurrencyInstitute.org was a privately registered domain through NameCheap, Inc that was created on June 28th, 2017. What is the community consensus regarding the site? Fortunately, the majority of the community consensus regarding the legitimacy of Crypto Currency Institute and Cryptocurrency Codex fall in accord with our review meaning that their operation is being blacklisted as a scam! CryptoCurrencyInstitute.org had a SimilarWeb global rank of 77,705 with a US rank of 36,273 as of February 14th, 2018. Reflecting inorganic signs of site growth, almost 30% of the sites cumulative traffic originates from referral, email and display ad sources while over 34% of the sites visitors derive from users within the United States. Crypto Currency Institute actively operates as a convincing landing page that is meant to acquire a visitor’s email address where they will then be solicited with the true offer of their operation. Later connecting them with Cryptocurrency Codex, CryptoCurrencyInstitute.org plays an equal part in this illusive and misleading investment opportunity that is meant to deceive newbie day traders. Functioning as an anonymous and unethical too good to be true scam, it is evident that this operation cannot be trusted which is why we only advise joining transparent and verified investment alternatives. Review Verdict: Crypto Currency Institute (Cryptocurrency Codex) is a SCAM! We ask that you please disclose any experience or insight you may possess regarding Crypto Currency Institute by leaving a comment below! To receive free scam warnings and in-depth reviews directly to your inbox, please feel free to subscribe to ScamBitcoin.com! For those of you who wish to disclose your experiences or concerns in a more discreet manner we encourage you to contact us via email. HEY YOU, who make this review, if it is real and Crypto Currency Institute is what you say a scammer, why the FTC.ORG don’t shot it down and why Click bank advertise it? and also, IF you don’t try it to show us the reality, why you make so bad comment? I think you steal the dream of millions of people and that means you are a scammer, a bad man who does a criminal activity against the low and humanity if you do accusations without to prove what you say. I’m about to become your subscriber but after read this review. I cancelled it. I bought this whole cryptocurrency institute and was completely satisfied with what they are offering. If you can find them, come back and put their contact numbers on this screen for everyone to see. They have disappeared from the contact board and are not reachable. This review is terrible, the information they provide is truly valuable and NOT a scam! This must be from a competitor of theirs. lol this whole website, is a big old scam hahah ironic. Did you even but the book?